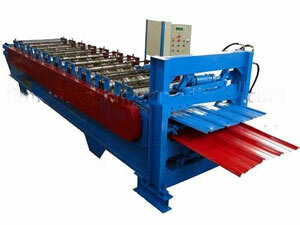 The color coated steel plate roll forming machine is used to press the colored steel sheet by rolling and cold bending. This equipment can press sheet into all kinds of wave pattern sheet, being able to press the sheet thickness 0.3~1.0mm. 1. Our experienced workers improve the design of the forming press and add a herringbone roller between wave crests of profile to meet the needs of all kinds of colored sheets and materials ( high and low strength). So the steel sheet from our company is flat, beautiful and increasing its strength. 2. The quality of rollers can be guaranteed, because they are processed intensely through high frequency hardening, quenching and tempering. Additionally, the sheet surface is hard chromium plating, so they are smooth and wear proof. 3. The length and measurement pressed by this equipment are controlled by the computer. So the measurement is accurate and the steel sheet is wear proof. The colored steel sheets produced by this metal forming equipment has the merits of light weight, high strength, rich colors, and earthquake resistance and fire resistance etc. This color coated steel plate roll forming machine is widely used in many fields, such as civilian building, warehouse, roof board, interior wall board, external wall board, decoration, etc. Other dimensions or types are also available, so offer your drawing, we will design and produce your desired colored coated steel plate roll forming machine within one month. Yingkou Changsheng Steel Structure Project Co.Ltd is a professional manufacturer and supplier of color coated steel plate roll forming machine in China. Apart from color coated steel plate roll forming machine like corrugated sheet roll forming machine840, deck floor roll forming machine, etc. we also offer auxiliary equipment products like automatic tube bending machine, plate bending machine, etc; high pressure polyurethane insulation painting machine including low pressure polyurethane foam machine and high pressure polyurethane foam machine; k-span machine, like automatic building machine, ultimate building machine and arch style buildings forming machine. With good quality and affordable price, the products produced by our company has exported Germany, Holland, India, Indonesia, New Zealand, Syria, United Arab Emirates, Russia, Kuwait, South Africa, and Bangladesh. If you are interested in our products, please contact us for details.